Andy Weir wrote a fabulous book called “The Martian” about an astronaut that, by a relatively feasible set of circumstances, manages to find himself stranded on Mars. Now, if you HAVE read the book or listened to the audiobook, and are a fan, here’s some other things to look into to “continue the experience”. 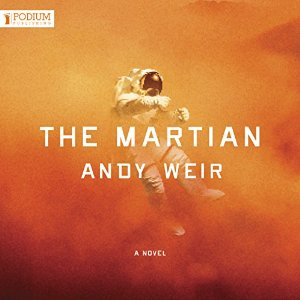 Andy Weir is the author of “The Martian,” a science fiction novel that follows astronaut Mark Watney as he becomes stranded alone on Mars. This is an hour long interview of Andy by Leo Laporte, host of the podcast, “Triangulation” from August 11, 2014. Adam Savage interviews Andy Weir about the science in his book, “The Martian”. In March 2013, Twentieth Century Fox optioned the film rights, and hired screenwriter Drew Goddard to adapt and direct the film. In May 2014, it was reported that Ridley Scott was in negotiations to direct an adaptation that would star Matt Damon as Mark Watney. The film is scheduled for release on November 25, 2015. On September 3, 2014, Jessica Chastain joined the film as the female lead. The cast will also include Kristen Wiig, Kate Mara, Sebastian Stan, Michael Peña, Mackenzie Davis, Jeff Daniels, Sean Bean, Donald Glover, and Aksel Hennie. Annnnd the movie trailers of The Martian are in! This entry was posted on Friday, February 27th, 2015 at 10:42 pm and is filed under Uncategorized. You can follow any responses to this entry through the RSS 2.0 feed. You can leave a response, or trackback from your own site.